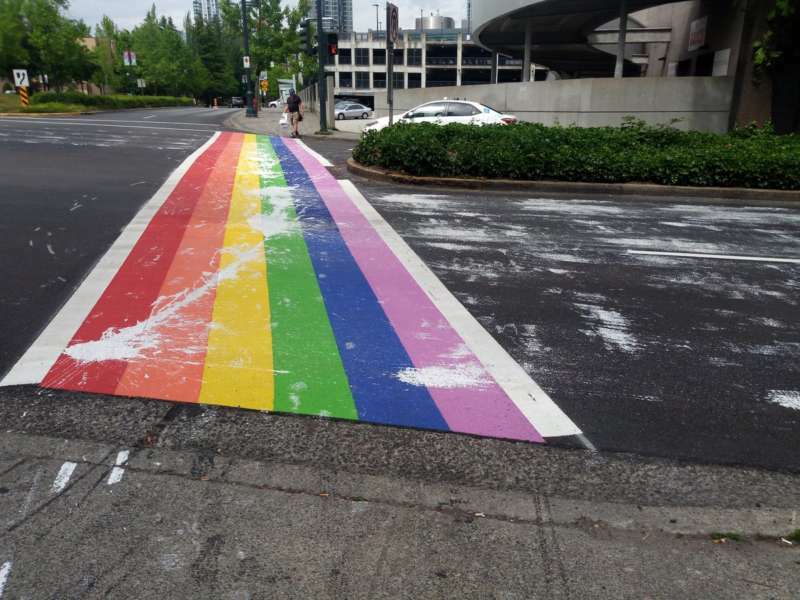 This week, we’ve already seen two rainbow crosswalks vandalized — and it’s only Tuesday. Last night, homophobes in Paris painted over one of the city’s rainbow crosswalks and wrote “LGBT out of France” on the street. 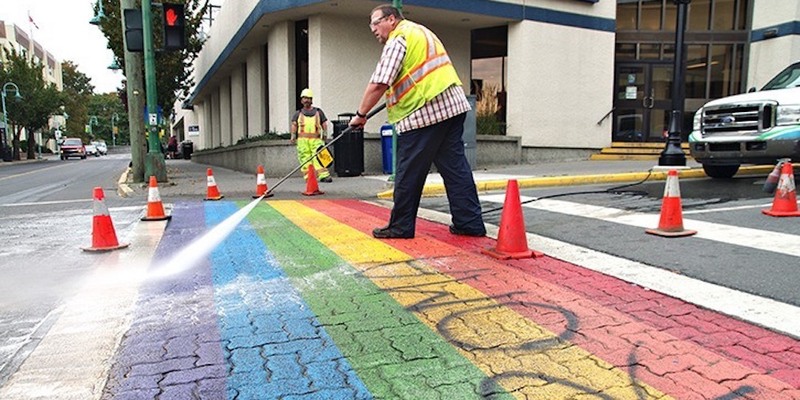 This weekend, in Surrey, British Columbia, another rainbow crosswalk was smeared in paint. And those aren’t the only rainbow crosswalks vandalized this month. 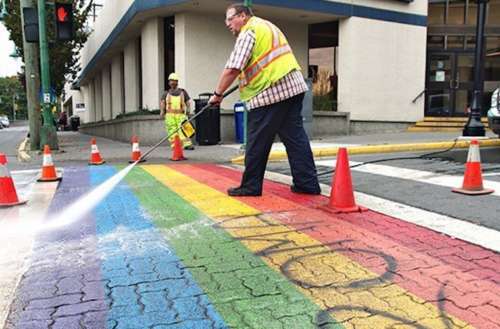 Surrey had just installed their new rainbow crosswalk on June 14. Though the cost for five years of upkeep was only C$8,500 (or just shy of $6,400), some members of the community objected. By this weekend, the Surrey crosswalk had been smeared with white paint. Thankfully, the rainbow crosswalk shouldn’t have to be repainted. It’s believed the vandals used latex or acrylic paint, which will wash off without damaging the crosswalk. Though B.C. police are currently not treating this as a hate crime until they find the culprit, the Paris incident is much less ambiguous. 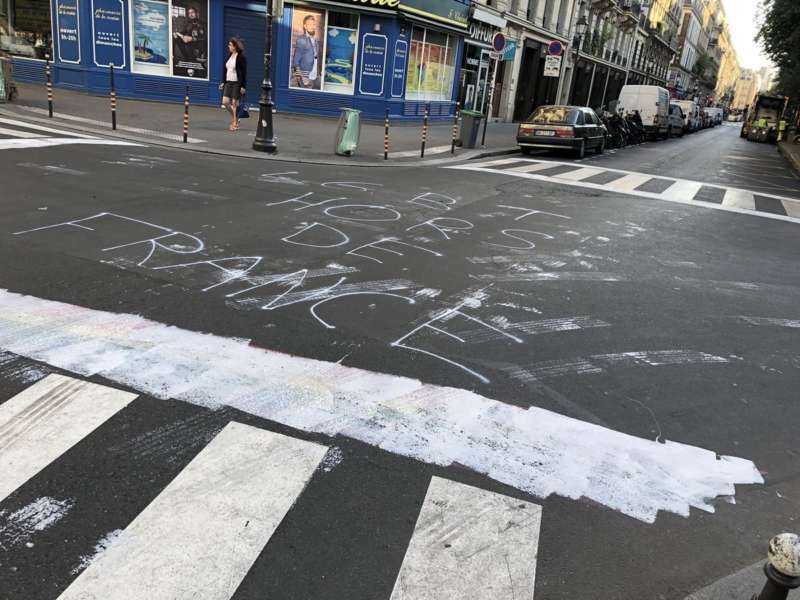 Here, the rainbow crosswalk was obliterated with white paint, and the words “LGBT hors de France” (or, “LGBT out of France”) were written in the intersection. In both cities, Pride weekend is this coming Saturday, so it’s hard not to see these as attacks on Pride. Thankfully, in both cases, the vandalism is being fixed. But these are far from the only times this month we’ve seen rainbow crosswalks vandalized. Earlier this month, in Nantes, France, vandals also painted over a set of rainbow stairs. And in Waterloo, Canada, a vandal left a black streak across that city’s newest rainbow crosswalk mere days after it had been painted. And another Canadian rainbow crosswalk in Eastern Passage, Nova Scotia was vandalized both by tire marks and spray-painted symbols. Last year, there were six reported instances of vandalized crosswalks by August. The rainbow crosswalks have become an easy target for cowardly vandals. What can we do when we see rainbow crosswalks vandalized?